This article by Marinel Valentini on the Latin American Pavilion at the Venice Biennale, is part of a series on the biennale by The Culture Trip. You can find other articles at The Culture Trip’s Venice Biennale Series. 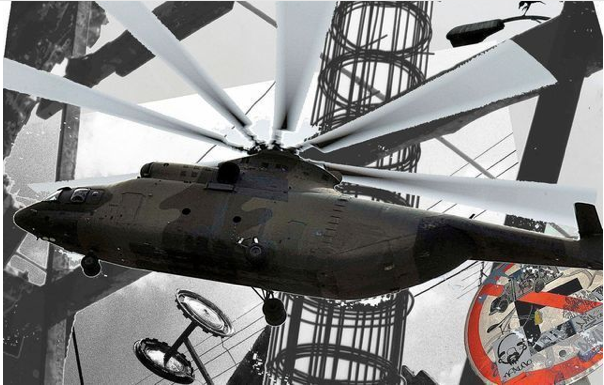 For the Latin American Pavilion at the 2013 Venice Biennale, which runs from 1 June – 24 November 2013, Alfons Hug and Paz Guevara have co-curated an exhibition that features artworks by a selection of contemporary artists from both Latin America and Europe. 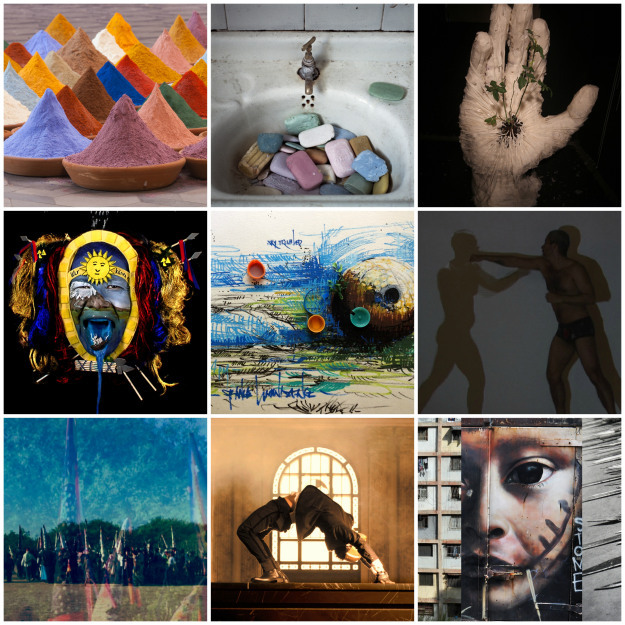 The Latin American Pavilion features artists from 16 South American countries and 3 artists from Europe. German curator and art critic Alfons Hug partners once again with Chilean curator Paz Guevara to co-curate the exhibition within the Latin American Pavilion at the 55th Venice Biennale. In particular, the Pavilion showcases the history of artistic collaboration between Europe and South America. Within the contemporary art context, this close cultural interaction and exchange between Europe and South America has intensified in recent decades. Some of the most influential Latin American artists have studied and worked in Europe; others continue living there, where they are now considered representatives of their new homeland. This exchange cuts both ways, as increasing numbers of well-known European artists work in a Latin American context. The Latin American Pavilion explores this new geopolitical aspect, investigating the experiences of cross-fertilisation between artists from the two continents. Entitled El Atlas del Imperio – The Atlas of the Empire, this year’s exhibition draws inspiration from the literary allegory found in the book Del Rigor en la Ciencia – On Exactitude in Science, by Argentinean author Jorge Luis Borges. In the book, Borges imagines an empire where the science of cartography becomes so exact that only a map on the same scale as the empire itself will suffice. The writings of Mexican writer Carlos Fuentes and Italian author Italo Calvino’s Invisibile Cities were also conceptual influences on the Latin American Pavilion’s theme. “In that Empire, the Art of Cartography attained such Perfection that the Map of a single Province occupied the entirety of a City, and the Map of the Empire, the entirety of a Province. In time, those Unconscionable Maps no longer satisfied, and the Cartographers Guilds struck a Map of the Empire whose size was that of the Empire, and which coincided point for point with it. The Following Generations, who were not so fond of the Study of Cartography as their Forebears had been, saw that that vast Map was Useless, and not without some Pitilessness was it, that they delivered it up to the Inclemencies of Sun and Winters. In the Deserts of the West, still today, there are Tattered Ruins of that Map, inhabited by Animals and Beggars; in all the Land there is no other Relic of the Disciplines of Geography.” — JORGE LUIS BORGES, On Exactitude in Science, 1946. Each of the artists selected for this year’s Venice Biennale designed his or her personal symbolic cartography in which importance is given not to topographical precision, but rather to the accurate observation of details, to interpersonal relations or to precarious situations of the present. The vast space of the Isolotto within the Venetian Arsenale will thus be transformed into a symbolic atlas in which Latin American and European artists are juxtaposed as a creative dialogue. 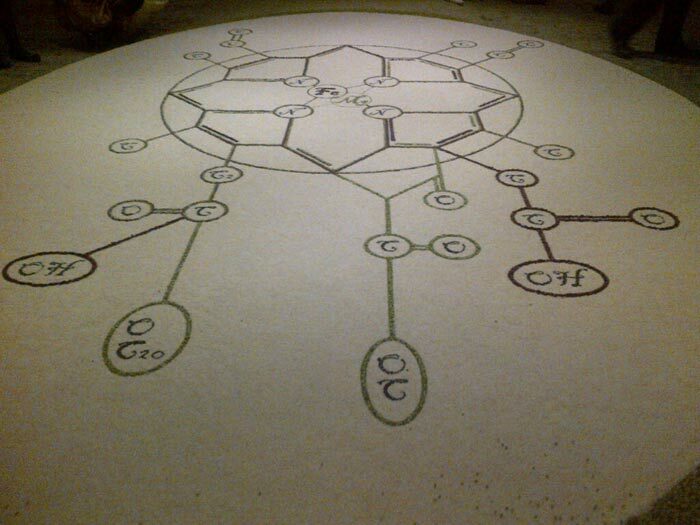 With natural organic rice, bean and dried pea seeds – the basic ingredients of the Mesoamerican and Caribbean diet – Lucía Madriz (Costa Rica) composed a large oval shape on the floor. Dispensing with the transgenic seeds (genetically manipulated to increase their resistance and productivity) that proliferate in the fields of Latin America and the world, Madriz displays a pure and natural plantation in the form of a tapestry. The artist has outlined the shape of a haemoglobin molecule by using contrasting colours, and superimposed to that is a chlorophyll molecule, thus revealing the structural similarity of these two key elements. While the haemoglobin carries oxygen in the human body, the chlorophyll in plants absorbs the light of the sun and transforms it into energy, thus triggering photosynthesis. For Madriz, the fact that these elements share the secret of life reveals the inherent connexion between human life and nature. In the face of the ideology of consumption and the latent threat to health and the environment of manipulated food, the installation entitled Vitalis (Chloros phylon-Sanguis) exhibits the immeasurable knowledge that naturally links forms of life on the planet, through the minimum units of the species. Humberto Díaz (Cuba) intervenes the Isolotto using 150 metres of rope. Knotted to this long rope are various objects related to the stages of development of the individual, from birth to death. 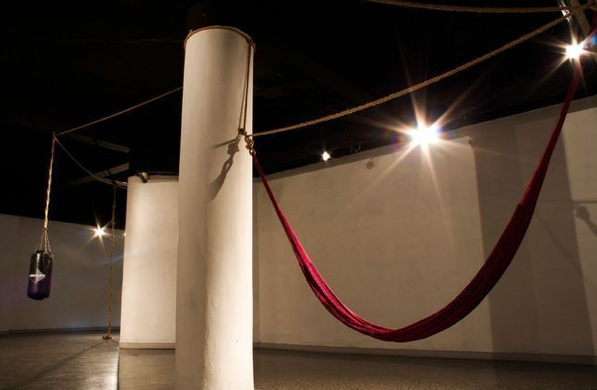 A swing, a punching bag and a noose are some of the items that Díaz has tied and distributed along this space, in a composition that includes a physical journey and an existential thread for the spectator. A spherical capsule with a deflated parachute simulates a landing in the midst of the exhibition venue. 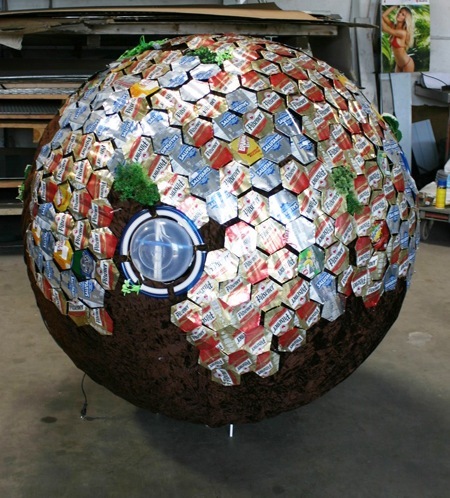 Produced with recycled material found in the streets and on the beaches of El Salvador, the sculpture Third World Sputnik by Simón Vega (El Salvador) is a colourful parody of Sputnik 10, a Soviet space programme satellite launched in the sixties. Vega’s precarious vessel contrasts with the sophisticated technology of the space race that took place during the Cold War, when the USSR and the USA competed to conquer space. Third World Sputnik aspires to modernity and dreams of progress; however, it comes up against the barriers of the Third World. In the face of a futuristic escape provided by a ship that might reach other worlds, Vega’s homemade Sputnik is bound to its context and the history, struggles and conflicts of its world – the Third World. In a minor scenario, ideological and military Cold War disputes were played out in El Salvador, where the struggle for power gave rise to a confrontation between parties aligned with the Western capitalist and Eastern communist blocs, between 1980 and 1992. This work is part of a series of drawings, diagrams and ephemeral sculptures, entitled Tropical Space Proyectos [Tropical Space Projects], which addresses some of the most significant spacecrafts and missions of the space race, in both the Soviet and the USA programmes. 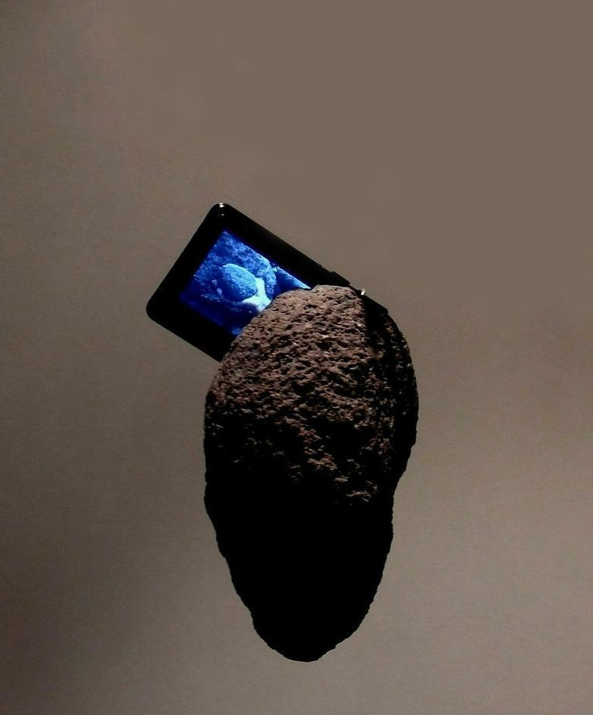 With a rock and an iPod, Marcos Agudelo (Nicaragua) has constructed a small ‘video-object’ in order to evoke memories of the lost grave of Andrés Castro, the Nicaraguan hero. In the style of an anti-monument, and by way of underscoring absence and neglect, the work rejects the large-scale commemorative features of existing elements. The rock extracted by Agudelo at the San Jacinto hacienda where Castro performed his heroic deed is the basis of the video, which shows hands in the act of burying or interring. During the National War of 1856, Castro, bereft of ammunition and with fewer men, brought down one of William Walter’s North American filibusters with a rock to the head, a feat which spurred his comrades to win the battle and eventually repel the North American occupation that threatened to extend to the rest of Central America. Castro’s deadly rock echoes David’s exploit in defeating Goliath and returns in Agudelo’s poetic arrangement – perpetuating the challenge and historical adjustment. Jhafis Quintero (Panama) struggles in turn against his shadow, his inner enemy and his ghost. In the manner of a boxing match, Quintero attempts to reach a projection of himself by means of the strength of his fists, facing an unreachable and ethereal opponent. While the artist’s breathing attests to his vitality throughout the round, the title of the video film – Knock Out – describes a boxer who has been overcome, thus suggesting the difficulty of the action depicted and – ultimately – the impossibility of reaching one’s own self. Susana Arwas (Venezuela) has photographed urban scenes in Venezuela, focusing particularly on large blocks of modern buildings as surfaces upon which the city’s ‘graphic comedy’ can be read. Arwas turns her gaze towards the political graffiti to be seen on some of the walls – a humorous and sarcastic commentary on the life and disputes prevailing in the city. Through her visual arrangements, the artist combines a variety of passages, messages and local public figures to give shape to a mosaic based on the street and social contingencies. In collaboration with the Italo-Latin American Institute (IILA) and Goethe Institut. Artists: Guillermo Srodek-Hart (Argentina), Sonia Falcone (Bolivia), Juliana Stein (Brazil), León & Cociña (Chile), François Bucher (Colombia), Lucía Madriz (Costa Rica), Humberto Díaz (Cuba), Miguel Alvear e Patricio Andrade (Ecuador), Simón Vega (El Salvador), Marcos Agudelo (Nicaragua), Jhafis Quintero (Panama), Fredi Casco (Paraguay), David Zink Yi (Peru), Collettivo Quintapata (Dominican Republic), Martín Sastre (Uruguay), and Susana Arwas (Venezuela). Additional artists: Luca Vitone (Italy), Christian Jankowsky (Germany) and Harun Farocki & Antje Ehmann (Germany/Brazil). In collaboration with: Cristián Silva-Avária, Anna Azevedo, Paola Barreto, Fred Benevides, Anna Bentes, Hermano Callou, Renata Catharino, Patrick Sonni Cavalier, Lucas Ferraço Nassif, Luiz Garcia, André Herique, Bruna Mastrogiovanni, Cezar Migliorin, Felipe Ribeiro, Roberto Robalinho, Bruno Vianna, and Beny Wagner.